The ALA Committee on Literacy defines literacy as the ability to use printed and written information to function in society, to achieve one’s goals, and to develop one’s knowledge and potential. In fact, literacy is one of the key action areas identified in the ALA’s current strategic plan. Literacy is key at the national level, but is also promoted at the state level. In Pennsylvania, a statewide initiative, PA Forward, promotes all of Pennsylvania libraries as agents of education and change by supporting five different literacies (basic, information, civic & social, medical, and financial). Individual public libraries have mission statements that revolve around literacy, information, and enrichment, where information and enrichment is obtained through literacy. And it’s good that libraries focus on literacy because the United States has a literacy problem. National Center for Education Statistics (NCES) conducted a survey which found that 90 million American adults read at the two lowest literacy levels, basic or below basic. 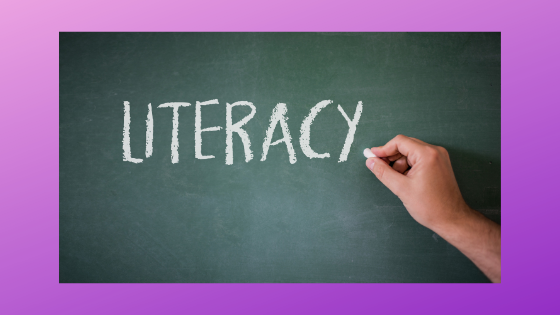 Studies show that those with poor literacy skills are more than twice as likely to be unemployed and tend to report poorer health, less trust, and lower civic engagement. Can public libraries really claim that they are informing and enriching individuals by supporting the development of literacy and lifelong learning if our citizens keep failing to meet basic literacy levels? In 2006, the American Institutes for Research published a study that demonstrated, “more than 75 percent of students at two-year colleges and more than 50 percent of students at four-year colleges do not score at the proficient level of literacy.” If we look at academic achievement to sort out our best and brightest, then how is it that over half of them lack proficient literacy skills? According to the National Center for Educational Statistics, 20% of adults in the state of Florida lack basic literacy skills. The public library system I am employed at does not currently offer adult literacy programs and has only begun offering digital literacy programs at individual branches. To see how many other public libraries in Florida offer basic adult literacy programs and/or digital literacy programs, I sent a survey through the Florida Library Association’s (FLA) listserv. Of the respondents, 58% reported having an adult literacy programs, and 64% reported offering digital literacy programming. Twenty-five percent of responding libraries said they did not offer either adult literacy or digital literacy programs. This push on digital literacy is problematic for another reason. Navigating the digital world requires the ability to read and comprehend text. User agreements, permissions, and even directions are typically written on the screen. Adults with low literacy skills are not able to read the warnings or fully comprehend the implications of contracts. At my library, directions to log onto the computers, work the print station, and even the patron code of conduct are typed up and posted around the library. When librarians begin with the assumption that patrons can read, we do a disservice to our patrons who lack basic literacy. Basic literacy is a crucial aspect of the services that public libraries provide. Without a solid grasp on basic literacy, patrons cannot fully participate in what the library has to offer. The By The Room 241 Team points out in their blog that literacy is a social justice issue and critical towards ending oppression and poverty. Increased literacy provides patrons with the skills to apply for jobs, understand budgets and financial options, sign up for health care and process medical directives. Libraries should offer digital literacy programs and help patrons navigate this brave new world, but they should not forget that the root of our service to a community starts with basic literacy.